Power comes in small packages, and Paperless Technologies offers several modules, each specifically designed to help your practice become more efficient and productive. Browse through our exciting list of available modules, all of which can be added seamlessly to your existing installation. 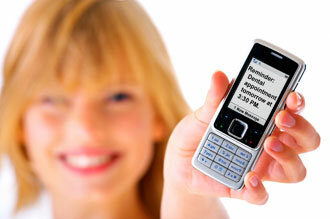 Remind your patients of their upcoming appointments, without doing anything! Automatic delivery of email and text messages remind your patients of their appointment date and time, and also include a link leading them to fill out all necessary forms online, before they come in. 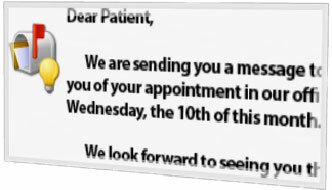 Patients can also confirm their appointment through this email, adding surety to your office's schedule. Once confirmed, your front office staff can receive a notification that appears on their computers, indicating confirmation information. Prior to their appointment, your patients can now complete all of their questionnaires online from the convenience of their own home. When your patients arrive for treatment, they simply finish the registration process and sign the previously completed questionnaires. Patients can access the online forms either directly via your website, or through a link sent in an automated reminder email . Once the forms have been completed, your office staff is notified through a pop-up message on their desktops, and the information is made available immediately on your servers. Reduce the extra time your patients have to spend in your waiting room, and move them along to treatment as fast as possible through online forms! Using the most advanced encryption and security measures, Data Exchange makes transferring patient information to any outside source easy, paperless, and fast. Using the patient records already in your electronic files, you can send patient information and documents, including digital X-rays, lab work, prescriptions, and necessary information to appropriate outside sources with the click of a button. Send any file in any format to any office at any time. Send not only documents, but data as well (such as medical alerts or registration information). Avoid manual entry; all data is transferred without requiring any typing. Collect and send information from the field. Send data to other industries. Doesn’t depend on cooperation of different management programs. 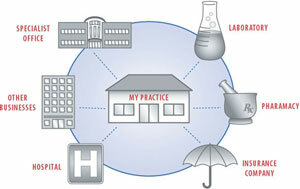 Practices with multiple offices in different locations can now access all patient files from any office, making it fast and practical to treat a patient at any location. PT Multi-Office eliminates the need to fax or courier patient files from one office to another. 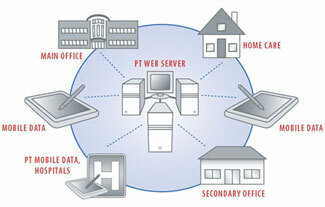 PT Multi-Office revolves around the PT Web Server, a remote server hosted seperate from your practice's network. As changes are made to a patient's file in any location, these changes are automatically detected and forwarded to the PT Web Server, where all other office databases are automatically and instantly synchronized. There is no need to create a complicated VPN or remote service program to have Multi-Office work, a simple internet connection will do! Keeping everything synched in real time allows your practice to have up-to- date information on every patient, no matter the location. PT Mobile Data is an exciting new technology that allows a doctor to carry his or her entire patient database on a Tablet or laptop computer, enabling him or her to access and edit patient files off-site. Changes to patient files are automatically synchronized with the main office database the moment the tablet or laptop is reconnexted to the office server. This is especially useful for treatments that need to be performed in mobile units or hospitals.